Citation: Ali S. Social Media Usage among Teenage Girls in Rawalpindi and Islamabad. Global Media Journal 2018, 16:31. Social media in the past few years have gained much prominence. Several social networking sites are introduced, and users are upturning day by day. Access to social networking sites is fast, convenient and, uncostly. Services they offer, are extremely enticing for the users worldwide. Social media is being used equally by all age groups, but young genesis sometimes seems more interested in using social media. Rice and Adhikari, stated that the use of social media among young generation has led to the rising of new concern regarding the use of SM. There is a growing body of theories and empirical research addressing the use and impact of social media, especially on youngsters. Internet in Pakistan has reached too high penetration levels. According to Yousafzai, availability of internet on mobile devices (3G, 4G), mobile subscriptions reached to 13.5 million users. Refined quality of service, broader spectrum and, ease of access all lead towards a higher number of internet adoption. Use of social networking sites and, search engines are among the major trends of social media usage in Pakistan. Facebook is the most popular SNS which handles approximately 3 billion connections per day, Google Pakistan has 2.5 billion connections per day, Instagram and, Twitter is also among the most popular sites and, as YouTube is blocked other video streaming websites i.e., Dailymotion and Tune.pk are the most accessed portals (State of Social Media in Pakistan). A rapid expansion of Social Media usage raises many concerns as many youngsters use social media on a periodic basis. According to Raju, Valsaraj and, Noronha, due to the availability of these social networking sites, there is a higher peril of getting reliant upon them. Lack of supervision, ease of access and, inappropriate can result in negative outcomes (p. 3). In this situation, analyzing their use of social media for educational purposes will not only aid them to get insight into their social media usage but, it will also help their parents and teachers to guide this young generation more about decisive use and, possibly better outcomes of social media. The popularity of SNS has much heightened in recent years. This might be because students especially teenagers seem more interested in it to get global access. Teenagers mostly use social media for educational and communication purposes which, not only helps them to acquire better academic grades and new social connections but also, it helps them to build their self-confidence and spirit of team-work. According to Siddique, students should be instructed to use social media for constructive purposes. Social media enable them to share and, receive information rapidly. It helps them to receive and share information through blogs to enhance their knowledge and, writing skills (Social Media: Its Positive and Negative Aspects). Access to information is agreeable than ever because of social media and it's widely spread availability even in far-flung areas. Thus, social media has expedited us a lot in terms of education and information. It is now, considered as one of the most authenticated educational sources in Pakistan. Khalid, in his study, states that "if social media is used by youth for gaining information and knowledge, it can improve their academic performance. It can also help them to achieve their academic goals and satisfaction with the policies of their educational institution in a better possible way. In this case, investigating the extent to which social media is being used by our youth is of great significance as most studies on related phenomenon focused mainly on either negative impacts on students' academic performance or, the poor psychological health of youngsters. With the help of this study awareness about the contribution of social media in education, will be disseminated very soon especially in remote areas of Pakistan. So, in the light of stated objectives, this study can guide the parents, teachers and other society representatives to critically evaluate the use of social media by our teenage generation. It can help to design new strategies to socialize our youngsters in a better viable way. This area of study is highly important because social media has become an integral part of our young generation's life. • To scrutinize how much social media is being used. H1: It is more likely that social media is frequently used for educational purposes by teenagers. H2: It is more likely that increased social media usage causes, increased dependency upon it. H3: It is more likely that frequent use of social media for educational purpose causes positive impacts on students' academic performance. Social media can have certain positive impacts on academic performance, to investigate this phenomenon Tarantino and McDonough  in their study proposed that using social media for the educational purpose can be profitable for students learning in numerous ways. Social media simplifies pursuit and knowledge transfer between students creating a deep-seated sense of understanding of their course material. Finally, they suggested that overall students learning can get heightened when educators incorporate social media into academic course content. DeAndrea  in their study "Serious social media: On the use of social media for improving students' adjustment to the college" investigated the phenomenon of usefulness of social media among college students and found that students feel more encouragement when they use social media for social and educational purposes Using social media for learning purposes can enhance the knowledge and abilities of students. They can get information and learn many skills by using different useful social networking sites. Social media is being used both for educational and social purposes, and thus, results in very significant reasons behind its usage. Social media usage, if analyzed in the light of uses and gratifications perspective, it will affirm how social media is fulfilling our various needs. Al-Jubayer  in his study "The use of SNS among teenagers" explored the questions regarding phenomenon related to the use of Facebook and issues related to its usage among students. Results marked that they use social media for educational purposes. 21% indicated that they use Facebook for dating, 14% responded that their family life is not amicable, so they use social media, 7% responded that their parents are boring and so on. So, this study concluded that the main reason behind using social media is both educational and social purposes. Hansen, Janice and Daniel, explored that whether the use of social networking sites has compelling effects on academic engagement and institutional commitment of the students and found that students adopt the use of social media to establish social connections with friends and family rather than for academic purpose. This study boosts an important fact which is also seen among teenagers in Pakistan that most students use SM for communication purposes which straightly affects their academic achievement. While analyzing the different aspects of social media, one cannot deny its presence as one of the most popular sources of gaining information and a positive synergy among students and teachers for educational purposes. Baruah  conducted a study to examine the effectiveness of social media as a gizmo of communication among people. In this study, the researcher proposed the idea of the online interaction of students and teachers for educational intent. She concluded that by using social media educational matters can be managed in a better possible way as social media technology are well capable of accessing the audiences all over the world. Uses and gratifications perspective of mass media reasonably shows the way mass media and particularly social media gratifies our certain needs. Whitening and Williams  investigated this phenomenon in their study and revealed that there are ten major gratifications that are being fulfilled by social media. These gratifications include Relaxation, utility, communication, entertainment; pass time, social interaction, sharing, knowledge/education, convenience utility and information seeking. Researchers further suggested a better and more comprehensive understanding of the reasons behind social media usage. There has always been a vital discrepancy in the use of social media between males and females. Lin  research in Taiwan showed that girls were more concerned about the positive academic use of social media while the boys were more keened to use social media in a negative manner. Thus, we can say that this difference is not finite only to social media, but other forms of media are also being used by males and females in quite distant ways. Students today, are seemed to be more concerned about the positive constructive use of social networking sites. Besides entertainment and communication, they also prefer social media for information and education. Kumar  in her research study, found that students showed more interest in using social media sites to write about their academic chores. The observation showed that most students started using social networks for academic aspirations while the others for socialization purpose. If it is used in an appropriate way, positive outcomes are pledged. Makaleler  conducted a study to assess that what are students using social media for? Does it affect their studies? Or, help them to learn easily? 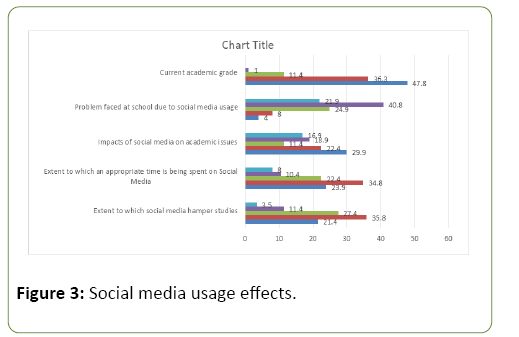 Results showed that students use social media for both social and academic objectives and that using social media websites in an inappropriate way does not affect their academic performance (Girane American University, North Cyprus). Buhari, et al. in their research study assessed the percentage of students using social media and, to what extent they use it? Findings of this study revealed that students use social media to interact, chat and to share information. Also, they spend more than five hours on social media. Findings also revealed that using social media has potentially helped and influenced them to attain good academic grades. So, in light of the results of this study, we can say that using social media is not only based on chatting or interacting rather allocating information is another positive aspect of social media usage. Social media can also have positive effects on student's academic grades if it is used in a felicitous manner. Social media facilitates students and teachers to communicate with each other. Nandez and Borrego  in their research study, found that the role of social media for communication and information is of greater connotation. Interacting with teachers or students for study intent is much common now a day. It plays an imperative role to keep students in touch with their teachers when it is needed (Use of Social Networking for Academic Purposes). Getting engaged in group chores not helps to perform well but, it also helps to build up students' self-confidence in their educational capabilities. Social connectedness to an institution is also of much importance today and, all this can be done by using social media for educational objectives. Hopkins  states that social media facilitates students to engage in collaborative efforts that help them to interact with each other for academic purposes. This increases students' connectedness with their institution. It can also be helpful in many other ways, for example, it can boost students' participation in many projects, it can provide a very pervasive experience of resources, it can also provide an additional benefit of video conferencing in the classroom etc. Almost students at every educational level use social media for a variety of purposes. Those who use it for academic purposes feel a beetling amelioration in their educational performance than those who use it for other purposes i.e., entertainment, communication etc. Guraya  in his study, probed the extent of use of social media for educational purposes. Results of the study revealed that 75% of students use social networking sites on a daily basis while 20% of them use them for educational purposes. This study broached the use of social media should be more for educational purposes so that, future doctors may get much advantage from modern technology regarding their education. Sabanci and Urhan  inspected the perceptions of young students about their use of social media for diverse purposes. This study found that according to students, use of social media is substantial for them as to where it fulfils other purposes i.e, entertainment, communication and information, there it also helps to gratify their educational needs in a capacious way. In the light of uses and gratifications perspective, it is apparent that most students consider social media as a source of fulfilling their certain needs. The way they perceive it particularly for educational purposes, they make it possible to use it to get educational help, support and eventually, it leads to better academic performance and strong institutional affiliation among students. From primary to higher educational level, social media should be used by students at every educational level as it can help them to provide academic help and can refine their educational adroitness. Besides, they should also be kept informed about the merits and demerits of its usage. Al-Sharqi and Hashimi  investigated the use of social media as a tool for learning among university students. Results showed that students consider the use of social media as a very useful tool for their academic help and performance and, advised that use of social media should be made possible for students at every educational level. Social media is not just a tool of communication or merriment. Positive outcomes can be attained if it is used for positive constructive ambitions. Teachers should play their role to guide their students about the positive facets of its usage. Tartari  in her study states, social media can be a very important educational gizmo. Findings of her study showed that social networking sites are a great tool for academic purposes. Further, the researcher gives propositions about the use of social media to get more improvement in education and guides teachers that they can boost their teaching capabilities by using social media. This study is governed by two major theories of mass communication which include: Uses and gratifications approach by, Blumer, Katz and, Gurevitch. This extensive theoretical framework explains audience intentional selectivity of media form and content that can gratify their certain needs. According to Whiting (2013), people use social media to keep themselves up to date about surroundings and to learn about digital news. It also aids us to get emotionally connected with the content. It helps us to satisfy our social integrative needs and, supports escapism (Tension Release Needs). Second major theoretical background of this study is Media system dependency theory. In this theory, Sandra Ball Rokeach and, Melvin DeFleur studied media audience in large social systems. The basic notion of this theory holds the idea that "the more audience may rely upon media, the more it gets importance in their life and therefore, media have more effects on them". It is one of the most substantial tools that can help them in a variety of ways. For example, without some social networking sites, a person is inept to know about recent news and updates. It is also a part of entertainment besides being "best business partner". Use of the internet is now highly exigent. In this investigation, the survey method was used to aggregate data from respondents of the study. Every questionnaire contained 30 questions regarding respondents' mode of social media usage, their number of visits, importance regarding its educational usage and, the role of social media in their studies. Data were collected from 200 teenage girls studying in four different schools and colleges of Rawalpindi and, Islamabad. The population of this study is based on teenage girls of twin cities (Rawalpindi and Islamabad) and the sample was chosen according to one of the most prominent sampling techniques named "Stratified sampling" by dividing the respondents in different proportions. The survey was conducted in September and October 2016. The questionnaires were administered personally by the researcher, by visiting the desired schools and colleges of Rawalpindi and Islamabad. From the given visual representation of responses, it is evident that about 54.0% of teenagers use Facebook as a most popular social networking website, Instagram is considered as second most used social networking site (17.5%) while, Twitter with 13.5% usage is the third most popular social networking site among the young generation of today. 11.5% respondents chose "others" which may include websites like Tumbler, Blogs etc. 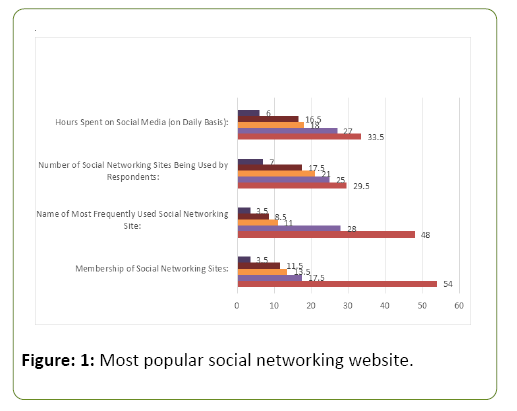 3.5% of respondents marked none of the above given social networking sites (Figure 1). Figure 1: Most popular social networking website. Similarly, Facebook is also aforethought as a most frequently used social site according to most of the teenagers (48.0%). While WhatsApp (28.0%) and Twitter (11.0%) are found most frequently used social networking sites respectively. 8.5% of respondents chose Instagram and 3.5% marked "Others (WhatsApp)" as their most often used social networking website. Results have shown that about 29.5% teenagers use one while, 25.0% use two and 21.0% teenagers use three and more social networking sites. About 17.5% of respondents use four or more social networking sites and 7.0% do not know that the definite number of websites being used by them. According to World Wide Worx and Fuseware, currently most popular social networking site is Facebook and, this popularity is briskly increasing due to communication, information, entertainment and, other related reasons (Motives influencing Facebook usage as a social networking site: An empirical study using international students). About 33.5% teenagers use social networking sites for more than 3 hours per day, which means most of the teenagers use social media for most of the day. While, around 27.0% of respondents use social media for almost 30 minutes per day whereas, 18.0% teenagers responded that their regular social media usage consists of only one hour a day. 16.5% youngsters said that they use social media more than two hours while 6% responded that they use SNS approximately for three hours. The Statistics Portal conducted a survey to investigate the use of social media per day and found that, in 2012, an average use of social media was 90 minutes, however in 2017, this usage has reached up to 135 minutes per day which means, social media is being used more than 2.5 hours per day which is rapidly increasing (Daily time spent on social networking by internet users worldwide from 2012 to 2017 (in minutes) (Figure 2). 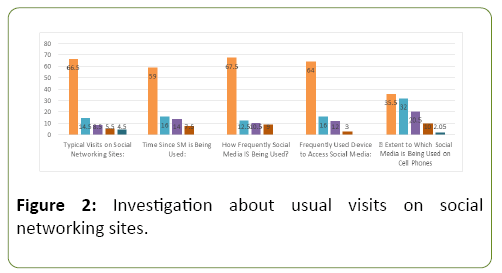 Figure 2: Investigation about usual visits on social networking sites. Respondents were investigated about their usual visits on social networking sites. About 66.5% teenagers responded that they sojourn at least once each day, 14.5% people said that they visit social networking sites at least one week and, 8.5% of them revealed that they visit them at least once each month. 5.5% respondents told they typically visit SNS less than once each month and, 4.5% responded that they do not use these websites. 59.0% of people responded that they are using social media since more than a year. About 16.0% people are using social media since less than a month while, 14.0% respondents are using it for 1-6 months and, 7.5% respondents said that it has been seven months to a year that they are using SNS. 67.5% respondents said that they use social media several times a day on daily basis. 12.5% revealed that they use it only once in a day and, 10.5% answered that they use social media only once a week. 9.0% of respondents said that they do not know that how frequently they use social media. Respondents retorted that about 64.0% of them use social media through their smart mobile phones, 16.0% of respondents access their social media accounts through their laptops and, 12.0% use tablet devices to use social media. 5.0% of respondents marked iPad and, 3.0% chose Personal Computers as a preferred device through which they access their social media accounts. Today, it is a banal perception that due to technological bombardment, social media usage among young generation has become more common. According to 35.5%, respondents said that very often they use social media on their smartphone devices. 32.0% generally use social media on their mobile phones and, 20.5% use it on their smartphone devices. 10% of respondents said that do not use social media on their cell phones while 2.05 said that they do not have any clue about it. Greenwood, Perrin and, Duggan, conducted a survey to explore the devices, being used to access social media sites. Findings revealed that 59% users, approach social networking sites through their smartphones as, according to them through mobiles, it is now easy to connect not only with Facebook, Instagram and Twitter but, communication apps like WhatsApp and, whisper are also convenient to access (Figure 3). Figure 3: Social media usage effects. For 34.5% respondents, social media doesn't hamper their studies, 25.5% consider that to some extent social media does impede their studies and, 16.0% responded that social media cramp their studies vary greatly. For 15.5% respondents, social media very greatly impede their studies while 8.0% do not know whether it hampers their studies or not. Respondents to give their answers regarding the extent to which their social media usage is appropriate revealed that 35.0% of them consider it very appurtenant that they use social media in a much sensible manner. 24.0% considered their social media usage is felicitous in their opinion while according to 22.5% respondents consider their social media is appropriate according to some extent. 10.4% respondents said that they do not spend an appropriate time in social media while 8.0% of respondents do not have any idea about it. Respondents were asked about the impacts of social media usage on their academic affairs and 30% responded that these impacts are positive. 22.5% concede these impacts as slightly positive and, 19% of them responded that there are no impacts of social media usage on their academic matters. 17% of respondents said that they do not have any idea about it while, for 11.5% respondents, social media has quite negative impacts on their academic issues. 40.8% respondents said that they have never confronted any problem at school or college because of their social media usage. 24.9% respondents that they have barely faced any problem and, 21.9% said that they do not know if they have faced any problem due to social media usage or not. 8.0% respondents said they have rarely faced some problem at school due to social media usage while 4.0% responded that social media has very greatly troubled them.48% of teenagers have "A" grade or above in their current academic level. 36.5% have B grade or above and, 11.5% of them have C or above grade. 3.0% of respondents said that they do not know about their current academic grade while 1.0% are having "D" as their academic grade These results were taken in a scenario when social media was highly being used by teenagers and the link between social media usage and their academic grade is interrogated in this question (Figure 4). 39.5% respondents consider that settings on social media sites very conspicuously keep them up to date about some information. 31.5% responded that these settings keep them up to date in a greater way while according to 20.5% respondents these settings are helpful for them in this regard to some extent. 6.0% of respondents do not know whether these settings keep them up to date or not and, 2.5% disagreed with this statement. Results have shown that preponderance of youngsters (39.5%) consider these settings as an important source to keep themselves up to date regarding informational needs. Ricketts (2014), states that almost all social networking websites help students to stay updated about different matters around the world. Also, upcoming events are being accessed by using school websites and, it is quite easy to access course material by using social media (Social Media Keeps Us Updated). According to 42.0% respondents, social media is a very helpful contraption to provide them educational guidance. 29.5% youngsters consider it as helping guidance tool on a moderate basis while, for 24.5% respondents, social media is backing them to some extent. 3% say that social media do not provide any educational guidance while 1.0% of respondents do not have any idea about it. Apparently, results have shown that a majority of teenage students consider social media as an important tool to get guidance regarding their academic matters. For 41.0% these respondents do not know that social media has ever interfered their ability to deal with their academic matters or not while, 17.5% responded that it has never baffled and, for 17.0% respondents it has interfered several times. For 12.5% respondents using social media has hindered their ability to deal with their academic tasks more than one time while 12.0% faced this interference approximately for one time. 40.5% respondents think that social media greatly provides career fortuities to young students while, 39.0% consider it very important as a career opportunities provider and, for 15.0% youngsters, social media provides career flukes to young students on a very moderate basis. 4% respond that they do not provide any career opportunities while 2.5% say that they do not know about it. Social media provides better career opportunities as Boylan, states that using social media for career searching is of vital importance as traditionally opportunities were less but today, competition is increasing and, access to career opportunities is also convenient (How to Take Advantage of Social Media During Your Job Search). For 27.0% respondents, things learned on social media are very imperative than things learned at school. For 25.0% of teenagers they are important and for 23.0% they are slightly important.19.0% responded that things learned at SNS are not important while 6% of respondents do not know about it. However, most them considered it important so it is apparent that the significance of social media for learning purposes is quite high for most of the teenagers (Figure 5). Figure 5: Membership on social networking. According to 32.5% respondents, their membership on social networking is very important for them. 26.0% consider it important and, 24.0% consider it slightly important for themselves. For 13.0% their membership on SNS is not important while 4.5% do not have any idea about it. For 39.5% of social media users, social media should be utilized by their teachers for educational purposes. 29.0% said that it should be very greatly used by instructor while, 23.5% respondents said it should be utilized to some extent by teachers. 6.0% of respondents said it should not be used by teachers and 2% say that they do not have any clue about it. Students were asked about how often they use social media for educational purposes and to communicate with their classmates and teachers. 39.0% responded that they often use it for this purpose, 37.0% marked very frequently to tell that they use more often for educational purposes and 13.5% use it to some extent for this purpose. 9.5% of respondents say that they do not. 40.0% of respondents considered that it can be used vary greatly. 29.5% responded that it can be used to get better academic grades and, third most viewed option by them (22.5%) was "to some extent". 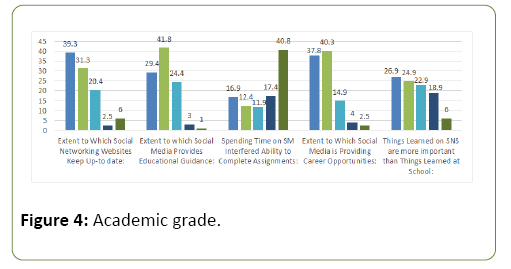 For 6.0% respondents, SM cannot help to get better academic grades while 2.0% said that they do not know about it. Students were asked to tell us about their opinion to the extent to which social media should be used by teachers to communicate with students, 40.0% said that it should be used very greatly. 27.0% responded that it should be used while 16.5% of them said that it should be used but to some extent. 8.5% say that they do not have any idea about it while for 8.0% of respondents do not consider as an optimum way for teachers to access their students (Figure 6). 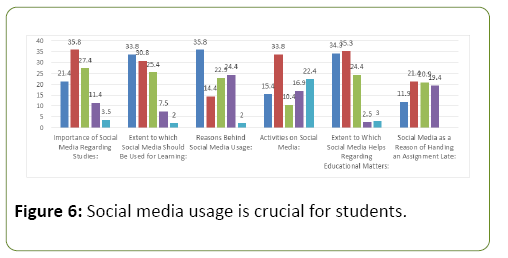 Figure 6: Social media usage is crucial for students. According to 36.0% respondents, social media usage is crucial for students, 27.5% teenage girls answered that social media is slightly important for students while, for 21.5% respondents, social media can be used as an exigent tool by students. 11.5% respondents found it less important while for 3.5% it is not important for students. Results showed that 34.0% youngsters responded that social media should be used very frequently in educational institutions, 31.0% respondents said that excessive usage would be enough while, 25.5% teenagers argued that social media should be used to some extent in educational institutions. 7.5% of respondents consider that social media should not be used in schools while 2.0% said that they do not have any clue about it. Here respondents were inquired about the main reason behind their social media usage. Out of all respondents, 36.0% revealed that they use social media chiefly for educational purposes. 24.5% use it to gather information and, 23.0% use social media for meeting new friends. 14.5% of respondents use social media to interact with their teachers while 2.0% of respondents use social media for certain other purposes. Respondents were asked about their activities regarding social media usage. Out of them, 34.0% responded that they use it to find and aggregate information. 22.5% teenagers revealed that they use it for studying and to fulfil their educational needs and, 17.0% use it to chat and interact with their friends. 10.5% respondents said that they update status while 0.5% responded that they use it for other purposes. When respondents were interrogated about the importance of social media as a helping tool regarding their educational matters, 35.5% of them responded that it is a great tool for educational help and guidance while, 34.5% were found more supporting social media as a helping tool while for 24.5% youngsters, social media is helpful to some extent. 3.0% consider as a crucial source of help regarding their educational matters while 3.0% of respondents did not know about it. For 12% respondents, social media is the main reason for handing an assignment late, 21.5% respondents considered it as a great reason. According to 21% respondents, it can become a reason of handing their assignment late on a moderate level, 19.5% did not consider it as a reason of this phenomenon while 26% respondents showed that do not know much about it. One-way analysis of variance (ANOVA) has shown that demographical factors have significant effects on increased media dependency with the, p<0.000, which is highly significant (Controlled) (Table 1). Similarly, the relation between demographical factors and educational aspect/ purpose is also highly significant as it is, p<0.000 (Controlled). Significance level between demographical factors and increased academic performance is, p< 0.008, which is also significant and thus, it is controlled either (Table 2). Table 1: One-way ANOVA (Analysis of Variance). There is 20.1% (r) association between social media usage and dependency variable. Significance level between them is 0.004(P). 16.1% association (r)) is found between social media usage and educational aspects, therefore, the P value is 0.023 which is significant. Similarly, an association between social media usage and academic performance is 23.5% (r)) and, the significance level is 0.001(P) (Table 3). The strong significance is found between Social Media usage and Dependency Factor as; P value is 0.002. However, 0.46 R Square Change and 0.467 beta value are found. In this table, social media is not significantly associated with educational aspects whereas, with 0.018 R Square Change Value Beta value is 0.226 and level of significance is 0.47. There is a high significance found between social media usage and academic performance with the P value of 0.001. However, 0.05 R Square value and 0.321 Beta value is found. Therefore, it is proved that there is a significant relationship between social media usage, students' increased dependency and, academic performance. The aim of this study is to find out the motive behind social media usage. The first and main hypothesis of the study is directional and, assuming a positive relation between stated variables as it is stated that "It is more likely that social media is frequently used for educational purposes by teenagers" which is later approved by hypothesis testing. According to Krishnan and his colleagues (p. 6). Availability of increased learning opportunities, students are improving their academic performance. To prepare young generation for broader public life, teachers and instructors can guide them towards for positive constructive use of social media (Using a Social Media Platform to Explore How Social Media Can Enhance Primary and Secondary Learning). Students today, are depending on social networking sites for knowledge and additional educational material. Besides their course books, they are subjected to bring more authentication and clarity by gathering additional study material. For this purpose, they lookup social media especially blogs, microblogs and other related educational websites which, leads them towards increased dependency on social media as our second hypothesis postulates that "It is more likely that increased social media usage causes, increased dependency upon it". The use of technology started right after the Thomas Alva Edison's invention of recording. Social media provide a variety of platforms to communicate, gain information and, get entertained. Thus, social media have changed the entire scenario of life and thus, have largely facilitated us (Strengthening the academic usage of social media: An exploratory study, 2017). Using social media for educational purposes have inevitably positive impacts on students' academic conduct as stated, "It is more likely that frequent use of social media for educational purpose causes positive impacts on students' academic performance". Mensah and Nizam, in their study, stated that social media have significant impacts on students' academic performance. However, time management is important because it is responsible to determine failure or success of an individual. Therefore, it is expected that educational institutions will educate their students about the fair usage of social media which can bring positive outcomes (THE IMPACT OF SOCIAL MEDIA ON STUDENTS' ACADEMIC PERFORMANCE- A CASE OF MALAYSIA TERTIARY INSTITUTION). Thus, postulations of this study are ratified and hence, it is proved that social media is mainly used for educational purposes and, it has quite positive impacts on students' academic performance. This study provides a systematic review of social media and its positive role. As the use of social networking sites has become an integral part of our lives, it is important to explore its different aspects and their possible impacts. According to Merchant, Wong and Moreno social media have become a popular mean of interaction and information sharing source. Consumers are now sanctioned to create, modify and, share content. The social media world serves a variety of purposes and thus, raises many concerns too (Using social media to engage adolescents and young adults with their health). Entertainment and communication are said to be most extrusive reasons behind social media usage but, this study focused on its educational aspects to throw light on its positive constructive facets. Social media provide a community-based platform to create and share information. This medium provides multiple blogs, micro-blogs and other related websites which have, great impacts on youth's lives. In Pakistan, there are multiple social networking sites that are being used on daily basis. People use them for distant purposes. According to Naqvi, most people use social networking sites to communicate with their family and friends while, others use them either for business or information purposes (Social Media Marketing in Pakistan: Trends and Impact, p. 3). Entertainment and communication are said to be main reasons but among students, social networking sites are also being used for educational and informational purposes. The reason behind stating three postulations was to extensively scrutinize the phenomenon. Findings will not only guide teachers and students, but they will also help parents to create a positive perception about social media. However, it is also imperative to know that proper time management and positive usage will bring positive outcomes and, eventually there will be an improved academic performance. Therefore, The broad pictures that emerged from searching and evaluating the phenomenon related to use of social media by our young generation have clearly proved that young generation today is using social media not only for entertainment and interaction purposes but, education and information are also their main concern regarding their everyday use of social media. Furthermore, the dependency of youngsters on social media usage is increasing but, positive impacts of social media on their academic performance is also an important phenomenon which is clearly approved in this study. Due to limited access and time, the researcher had to select a sample size of 200 female individuals. As study mainly focuses on teenage girls so it was important to execute the survey in a more delicate manner however, more investigation on related phenomenon will be of greater significance. I thank Allah Almighty to give me an opportunity to complete this research work and to accomplish my goal for successfully earning my continuous personal obligations. (Alhamdulillah). I was fortunate to have Doctor Saqib Riaz, Chairman of the Department of Mass Communication, Allama Iqbal Open University, Islamabad, as my supervisor. I would like to thank Doctor Fouzia Syed, Lecturer, The Department of Human Resource Management (HRM), International Islamic University, Islamabad. Lastly, I am thankful to my Mother for trusting my abilities, praying for my success and supporting me at every step. She has always been a guiding light for me to find my way, without whom I wouldn't be able to achieve my goals. Taratino K, McDonough JM, Hua M (2013) Effects of Students' Engagement with Social Media on Students Learning. Deandrea DC, Ellison NB, Larose R, Steinfield C, Fiore A (2012) Serious social media: On the use of social media for improving student's adjustment to college. The Internet and Higher Education 15: 15-23. AL-Jubayar M (2013) A study of Facebook users in Dhaka. The use of Social Networking Sites among Teenagers, pp: 35-44. Baruah TD (2012) The effectiveness of Social Media as a Tool of Communication and its potential for Technology Enabled Connections. A micro level study 2: 225-315. Anita W, David W (2013) Why people use social media: a uses and gratifications approach. 16: 362-369. Tsai C, Lin SS (2001) Analysis of Attitudes towards Computer Networks and Internet Addiction of Taiwanese Adolescents. Cyberpsychology & Behavior 4: 373-376. Kumar K (2015) The Negative Impact of Social Networking Sites on College Students. International Journal of Science and Research (IJSR) 4: 1015-1020. 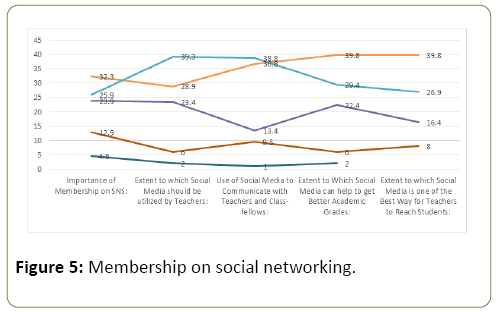 Makalaler OO (2013) The Effects of Social Networking Sites on Students Academic Performance in Girne American University. Buhari SR, Gambo AI, Bashir H (2014) Use of Social Media among Students of Nigeria Polytechnic 4: 24-26. Nandez G, Borrego A (2013) Use of social networks for academic purposes: a case study. The Electronic Library 31: 781-791. Hopkins B (2016) Advantages of Using Social Media in Education. Guraya S (2016) The usage of social networking sites by medical students for educational purposes: A meta-analysis and systematic review. North American Journal of Medical Sciences 8: 268. Sabanci A, Urhan MU (2014) Profiles of Secondary School Students: Use of Social Media and their Views about its Outcomes to Learning. International Journal of Academic Research in Progressive Education and Development 3(1). Sharqi LM, Hashim K, Ahmed HA (2016) Perceptions of social media as a learning tool: a comparison between arts and science students. International Journal of Social Media and Interactive Learning Environments 4: 92. Tartari E (2015) The Use of Social Media for Academic Purposes in Students' Learning Process. Academic Journal of Interdisciplinary Studies.